911 Book: We're Serfs on the Rothschild Estate by Henry Makow Ph.D. This unpretentious book shows how humanity is under constant covert attack from Cabalistic (Masonic) Jewish bankers, their allies and dupes. They contrive all wars to degrade, disinherit and ultimately destroy us. If we heed the call of war, we are complicit in our own destruction. Edward Hendrie is a lawyer. 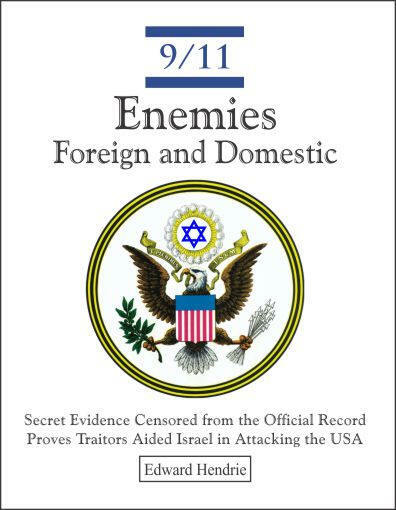 His book, "9-11 - Enemies Foreign and Domestic" builds an irrefutable case that 9-11 was an egregious fraud and act of treason perpetrated against the American people. Clearly, a large segment of the US political, military and media class is complicit in the mass murder and/or cover-up, from the President on down. The book carefully dissects and discredits the official story and places the attack in the context of numerous other Zionist false flags against the US (Beirut Marine barracks, USS Liberty) designed to change US policy. Hendrie effectively explains the broad religious context, i.e. the Cabalist Jewish vendetta against mankind. I haven't read anything for a while that so vividly exposes the control Illuminati bankers have over our lives. Hendrie shows that many of the "eye witness" accounts were employees of the TV networks and that real eye witness reports of no planes were ignored. Furthermore, the BBC reported the collapse of WTC-7, a 47-floor building, 20 minutes before it occurred. AP and CNN prepared obituary pictures for the 9-11 passengers three days before the attack occurred. The purpose of 9-11 was to create a Zionist police state and to justify wars against Iraq, Afghanistan and Iran. Hendrie believes the Iraq war was prompted by Sadaam Hussein's decision to stop trading oil in dollars. Apparently, the bankers need petrodollars to support the burgeoning US debt. Hendrie believes no planes crashed on 9-11. He speculates that the passengers of UA-93 were unloaded in Cleveland and murdered at a NASA facility at the airport. The damage at the Pentagon, which killed 125 people, was caused by explosions. The attack targeted offices where accountants were investigating the disappearance of $1.2 trillion. Hendrie makes clear that Cabalist Jewish bankers are at the heart of the conspiracy and Zionism is its most powerful instrument. He makes an irrefutable case that Mossad organized and executed the 9-11 attack. Senior members of the Bush administration were active collaborators. Clearly, the Illuminati bankers depend on the collaboration of millions of Freemasons and other non-Jews willing to sell their soul to the devil, and betray their country for personal gain. Our situation is analogous the movie "The Invasion of the Body Snatchers" where an alien force has occupied the minds and souls of the people. The nations of the world have been profoundly subverted by evil. But the truth remains the truth. Edward Hendrie has made a huge contribution to it by writing this book. I thank him.